FOOTBALL: Southampton has produced a perfect counter-attacking performance to reach the EFL Cup final with a 1-0 semi-final victory at Liverpool. 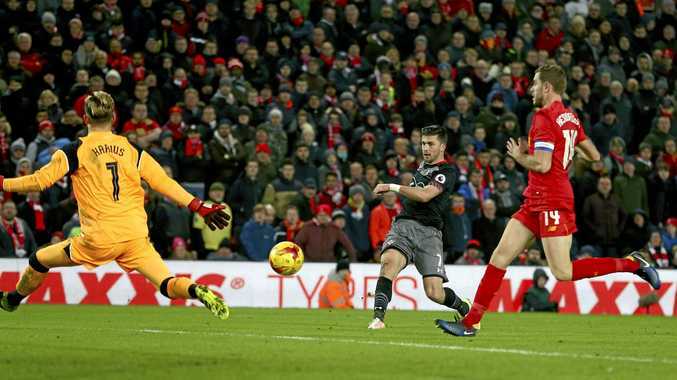 Shane Long scored a breakaway goal seconds after the Reds had a penalty appeal turned down late in the game to win 1-0 0on the night at Anfiield and secure a 2-0 two-leg aggregate success. The Saints, looking to reach a first League Cup final since their loss to Nottingham Forest in 1979, soaked up heaps of Liverpool pressure but the home side could not turn 73% possession into goals. In fact, the visitors should have wrapped the game up inside the first 45 minutes but Dusan Tadic's close-range shot was blocked by keeper Loris Karius and captain Steve Davis blazed another great chance high and wide when he should have done better. Liverpool did have chances in the second half but the out-of-sorts Daniel Sturridge wasted its two best chances, while referee Martin Atkinson turned down that late penalty shout when substitute Divock Origi went down under Jack Stephens' challenge. Moments later, another Southampton counter led to Long finishing superbly from a tight angle to set up a Wembley final next month against either Manchester United and Hull City. United leads that semi-final 2-0, with the second leg to be played in Hull overnight. If the Saints can win the final on February 26, it will be the club's first major trophy since the 1976 win in the FA Cup final against United. Southampton reached the decider without conceding a goal in this year's competition. Saints boss Claude Puel is now unbeaten in six games against Liverpool as a manager (W3 D3).